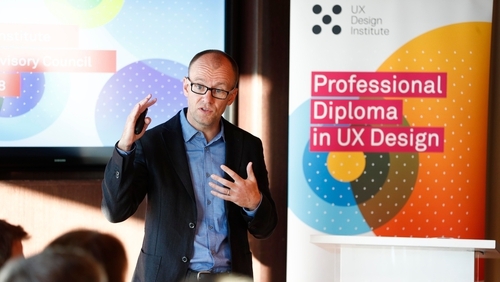 The new course offered by UX Design is the world's only university-accredited online user experience (UX) design course. UX is to the tech industry what architecture is to the construction industry and provides high-level and detailed design to ensure digital products such as mobile apps and websites are easy to use and fit-for-purpose. According to UX Design Insitutue, the most successful tech companies, including Amazon, Apple, Google and Facebook, invest massively in the technology. Research shows that the tech industry in EMEA alone will need 580,000 UX designers by 2024 in order to keep pace with the growth of software development. The company currently has a workforce of seven in its Dublin office, with the new positions announced today include sales, marketing, operations and finance roles. The company's CEO and founder Colman Walsh said that UX is fast becoming the de facto process for developing software. But he said that the traditional education sector is not keeping pace with the demand for UX designers and universities are not producing enough qualified graduates, while the alternative education sector is unregulated and unaccredited. "We’re growing our team to expand our reach and develop more accredited training programmes that meet the needs of employers and jobseekers. We want to set the standard in UX education globally," he added.